Patricia Tavenner was born March 22, 1935. She had been living in Oakland, California, and became known as “Mail Queen”. 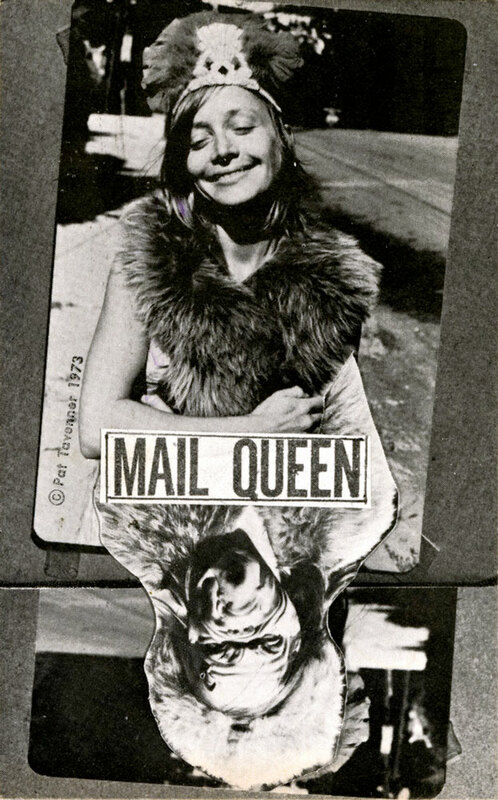 She entered into the Mail Art network in the early 1970s, with the publication of her, “Mail Order Art”. She published four issues from 1971–1972, that served as a distribution system for artists. 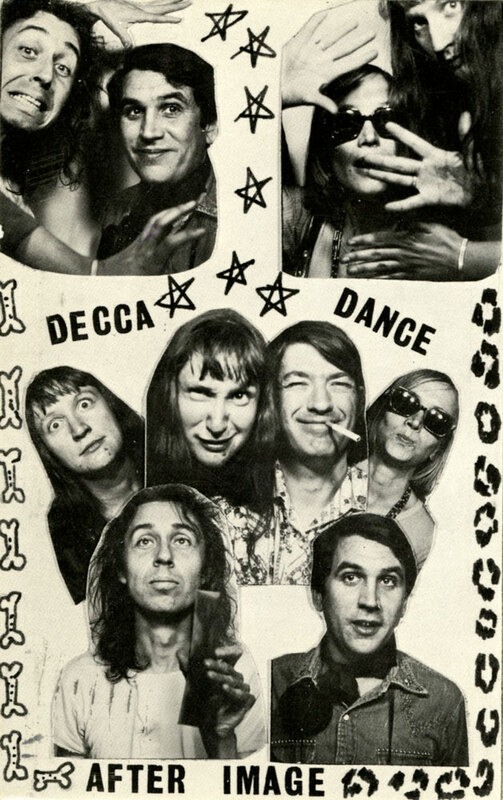 Tavenner was part of the Bay Area Dada Group in the mid-1970s. She was a fierce advocate of women’s issues in the arts, co-founding the Northern California Women’s Caucus for the Arts in 1972. In addition to her role as publisher, she was also one of the early producers of artist postage stamps (artistamps), and was included in the first exhibition of the medium, James Warren Felter’s, “Artists’ Stamps and Stamp Images”, held at Simon Fraser University, Burnaby, British Columbia, Canada, in 1976. She was one of fourteen contributors representing the United States in the exhibition. She continued her artistamp activity over the years, curating the “First California Artists Stamp Show” in 1995, and an exhibition on women artistamp producers for The Stamp Art Gallery in San Francisco in the 1990s. In 2007, Tavenner contributed to and attended the Budapest, Hungary, National Museum of Fine Arts exhibition, “ParaStamp: Four Decades of Artistamps from Fluxus to the Internet”, organized by the Artpool Research Center (György Galántai). Tavenner continued her publishing activities as well. Her Eternal Press published several editions of the periodical, “An Artist Speaks”, and “A Family Line”, documenting a video she produced on her family, as well as the autobiographical, “Four Years and More”. She was a long time instructor of the Berkeley Extension Center in San Francisco, and a practicing astrologer. In November of 2012, the San Francisco Museum of Modern Art published a tribute to her work, which can be found here: Receipt of Delivery. Patricia Tavenner passed away on May 10, 2013. Patricia Tavenner wurde am 22. März 1935 geboren. Sie lebte in Oakland, Kalifornien und war als “Mail Queen” bekannt. In den frühen 1970er Jahren trat sie mit der Veröffentlichung ihrer “Mail Order Kunst” in das Mail Art-Netzwerk ein. Von 1971–1972 veröffentlichte sie vier Ausgaben, die als Verteilersystem für Künstler gedacht waren. 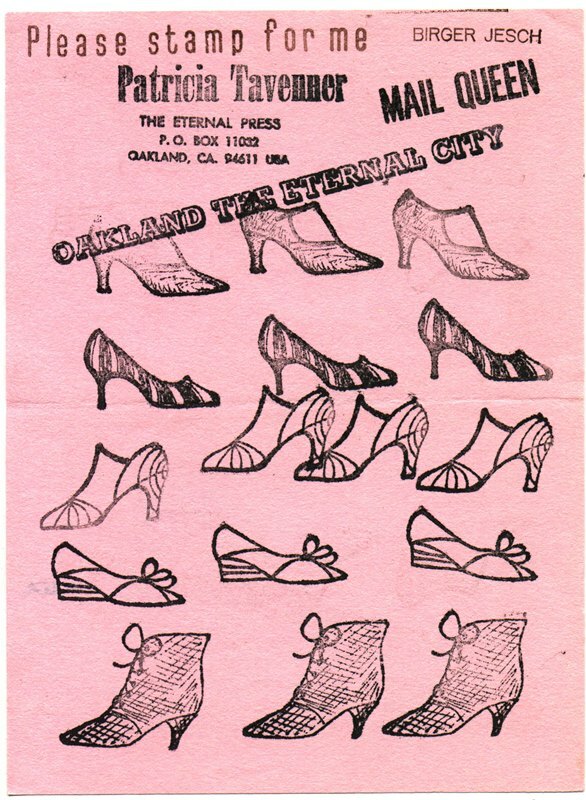 Patricia Tavenner war eine heftige Verfechterin des Frauen-Themas in der Kunst und 1972 Mitbegründerin der Northern California Women’s Caucus for the Arts. Sie war in der Mitte der 1970er Jahre ebenfalls Teil der Bay Area Dada-Gruppe. Neben ihrer Rolle als Verlegerin war sie auch eine der ersten Produzenten von Künstler-Briefmarken (Artistamps). Sie war an der ersten Ausstellung des Mediums, die James Warren Felter organisiert hatte, beteiligt. Die Schau “Artists’ Stamps and Stamp Images” wurde im Jahr 1974 an der Simon Fraser University, Burnaby, British Columbia, in Kanada gezeigt. Patricia Tavenner war eine der vierzehn Mitwirkenden aus den Vereinigten Staaten. Sie beschäftigte sich viele weitere Jahre mit Artistamps und kuratierte 1995 die “First California Artists’ Stamp Show” sowie eine Ausstellung über Artistamps von Frauen in der Stamp Art Gallery in San Francisco in den 1990er Jahren. Im Jahr 2007 besuchte sie Budapest. Die Ausstellung “ParaStamp: Four Decades of Artistamps from Fluxus to the Internet” wurde vom Artpool Research Center (György Galántai) organisiert. Patricia Tavenner veröffentlichte mehrere Ausgaben ihrer Zeitschrift “An Artist Speaks”. In “A Family Line” dokumentierte sie ihre Familie auf Video. Sie veröffentlichte ferner den autobiographischen Text “Four Years and More”, wirkte viele Jahre als Lehrerin am Berkeley Extension Center in San Francisco und war eine praktizierende Astrologin. Im November 2012 veröffentlichte das San Francisco Museum of Modern Art eine Hommage an ihre Arbeit, die hier gefunden werden kann: Receipt of Delivery. Patricia Tavenner verstarb am 10. Mai 2013.